Should have seen "Yay, you are online!" page. Then I can no longer reproduce. It seems we have some unsafe race when reloading before the unregister() promise completes. 1) "Service worker change, registered the service worker" shown on the page and the web console shows "[oninstall] Cached offline page 'http://localhost:8080/offline.html'". 2) "An active service worker controller was found, no need to register" shown on the page and no logs in the web console. 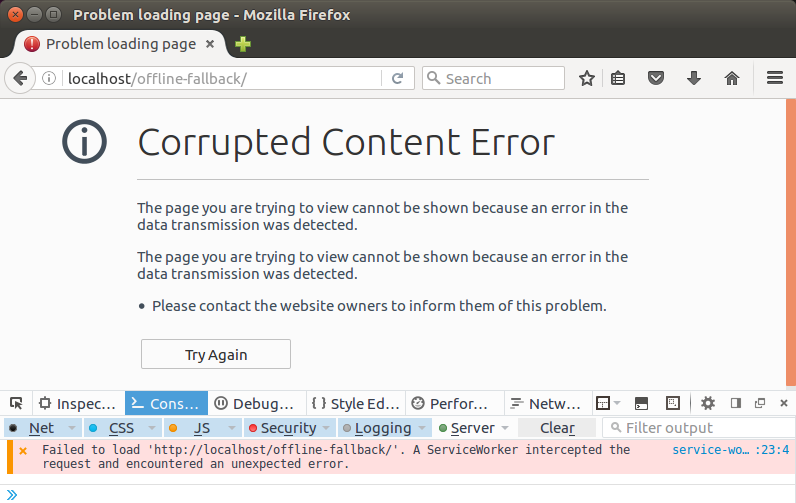 3) Content corrupted page with this in the web console "Failed to load ‘http://localhost:8080/?1470016121244’. A ServiceWorker intercepted the request and encountered an unexpected error." 4) Only once I saw the same as (1), but also an error about the service worker script fetch failing. With the code modifications in comment 1 I consistently get only result (1). Sam, please be aware if you require basic auth on the offline.html page itself (or any pre-cached pages fetch'd in the install event handler) they will be cached as failed authorizations. We don't have a window to associate the authorization with in the install event, so I think you will always get a failed auth for those fetches. I think this is unrelated to the content corrupted page, though. It is not clear what information you need from me. I will say that my current code base loads the cache entirely from the "client" process (i.e., the browser), and I can verify that the cache contains successful results, and I do NO fetches from the service worker (not precisely true: the code will try a fetch if the object is not in the cache, but I have verified that that path is not being executed). Even so, I still get either content corrupted or failed authorization errors (again, despite verifying that the cache only contains successful responses). In the case of failed authorization errors, a shift-F5 reload from the server, and in the process throw up a modal dialog prompting for user and password, and after that point the service worker generally behaves, but exiting the browser completely and starting again can cause me to get authentication errors again. I'll be glad to share my code, but I thought it best to start the conversation with the posted service worker examples. Sorry. I guess it was more just an fYI about a problem with the example code. If that does not reflect your real situation, then that is good. The behavior I was seeing in the example was a failed auth page when the server was offline. In localhost http testing I don't think we consider this to be mixed content. Filed bug 1291448 about blocking about:neterror as mixed content. We could just reset the channel here, but I'd like to figure out why we are GC'ing the RespondWithHandler first. We really need to wait to do this until the active worker is idle. This is very similar to bug 1170543. I'll make these entry points check the active worker idle state. I'll also add this to the spec issue. With these patches I can no longer trigger the failure locally. I will write a wpt test that exposes the problem next. This fails without the P1, P2, and P3 patches. It succeeds with the patches. We should release this with bug 1170543 if we can. Step one is to expose the "registration is idle" state in a convenient way. later patches will then use this method. This patch simply cleans up the logic in ServiceWorkerManager::StopControllingADocument() to use our traditional "short circuit return" style. It has no functional change. Do the actual work of delaying registration teardown until after the registration's active worker has gone idle. Add a test case verifying we wait to teardown the registration until the active worker is idle. I put this in activation.https.html because its nearly identical to the other tests there. Its just a bit of a misnomer because its not about activation but instead about unregister. It doesn't seem worth the hassle of renaming the test or creating a new test file with duplicate logic. - ServiceWorkerManager::StopControllingADocument if the document removal raced the unregister. For this specific test, it won't be this one because nsDocument::SetScriptGlobalObject should get synchronously called by the remove() and call through to this path prior to the unregister call in the test. - Step two is gated on the unregister job completing (in step 5, after flagging uninstalling in 4, with step 6 skipping with us assuming that your proposed change of "using the service worker" at https://github.com/slightlyoff/ServiceWorker/issues/916#issuecomment-237272060 will go through). We wait for the the "waiting" SW to be marked redundant, which will occur when ServiceWorkerRegistrationInfo::Clear() is invoked by SWM::RemoveRegistration(). That happens when we postMessage the "active" SW which resolves its MessageEvent waitUntil() which results in SWM::WorkerIsIdle being invoked. - Step three is just checking that the Clear() totally happened. > I don't think this is actually related to the basic auth. I do think that what you are fixing is an important bug, but I'm increasingly convinced that the bug I wanted to report on is different than the one being fixed. Once there is a stable version (preferably in a nightly build, but if necessary I can build it myself - it has been a while, but I used to be able to build firefox on my machine), I'll follow up (either in this bug or a new bug - I care not) with a reproduction scenario, this time using Python's SimpleHTTPServer. > > I can reproduce. > > I don't think this is actually related to the basic auth. > the one being fixed. Please do! I was not aware you saw another error beyond the corrupted content after pressing "View Complete Demo Again". If you run into more problems, please file them as a new bug and need-info me. Thanks! Can you reproduce the problem with one of these builds? Will do once this lands in a build. Meanwhile, the scenario I wanted to report on is one where the cache is loaded correctly, and the service worker correctly returns that data via event.respondWith many times. All is well and good until the browser is completely closed and then the user restarts the browser and attempts to visit the page. The result is a 401 response. There is no opportunity to provide a user and password, just an unconditional authentication error. In fact, no request is sent to the server in this scenario. Because the cache is available to the browser (client) process, I can verify that the data in the cache is still correct. I'll try one of those builds either late tonight or tomorrow (I'm East Coast US). > Will do once this lands in a build. > fact, no request is sent to the server in this scenario. Yes, I can reproduce this. > that the data in the cache is still correct. At least for the offline-fallback demo its not pulling any data from the Cache. The service worker just proxies the connection through. I'll file a new bug. Thanks. This does not reproduce locally, but my best guess is we are delaying the unregister because we happen to catch the worker in the activating state while its processing the no-op activate event. > while its processing the no-op activate event. Actually, that shouldn't matter. Because the uninstalling flag should be set. Let's see if that fixes the issue here. Since the other test case is racy, lets explicitly test getRegistrations() with the uninstalling flag set. The try build indicates this fixes the problem with the previous landing. I also got preliminary spec approval from Jake on IRC. Basically we getRegistrations() should be doing the same thing as getRegistration(). A registration that has a pending uninstall should not be returned. The additional test case verifies that getRegistrations() hides registrations with pending uninstalls. It does this by holding a controlled frame alive and calling unregister(). In this situation the registration gets the pending uninstall flag, but does not actually go away. This test fails without the P5 patch. It succeeds with the P5 patch. Is there an idiom for using GetWeak() when we know the result will already exist? Or an idiom change to favor this style since the pointer gets directly returned (and AddRefed by the refptr) rather than requiring a separate declaration line and manually typing getter_AddRefs for the obscured outval? Yea, I just wanted to assign to the RefPtr in a single statement. I think the push tests are generally a bit racy in that very few of them wait for the service worker to become active. Changing the timing could cause these races to finish in different ways. Kit, this patch makes the dom/push/test mochitests consistently wait for service workers to be active. We were only waiting in a few cases here before. I think to avoid races we should generally wait for active workers all the time. It did not seem like any of these tests were purposefully trying to test push against installing or waiting workers. Even if this does not fix the failures in the last backout its still probably a good thing to land. Ouch. Thanks for fixing these, Ben! Just so I understand: this is different than `navigator.serviceWorker.ready` because that resolves if the worker is "activating" or "activated", right? > because that resolves if the worker is "activating" or "activated", right? No, I think .ready resolves on activated. Its more to avoid accidentally using a previously active service worker. If you already have an activated service worker .ready resolves immediately. So after a .register() you usually want to wait for .installing to really test your new worker. Also, .ready doesn't let you wait for a different scope activation which some of these tests needed. Ugh... After 24 hours I finally got two winxp test results. One of them is a failure. Although it failed in a different way. Now its timing out right at the start. The previous test exercises our "long running SW, kill it with fire" code paths. I suspect we are leaving a token count non zero there which make the SW seem like its non-idle forever. This then prevents the previous worker from every being completely evicted. Ugh, I think this is a race in worker holder code. I'm going to file a separate bug. I am fairly confident bug 1293690 is the issue here. I added some NS_ASSERTION(false) calls to log stacks and managed to trigger the same timing that the winxp automation is hitting. My patch for the other bug seems to fix it. Will push a new try build in a bit. The try build has all green winxp M(3) results with bug 1293690 in the mix. Just have to wait for baku to come back from PTO next week to review it. The patches in bug 1293690 make the UseWorkerHolder() call fail here if the worker is already terminated. Backed out in https://hg.mozilla.org/integration/mozilla-inbound/rev/252ff19cd746 for the build bustage from bug 1293690.